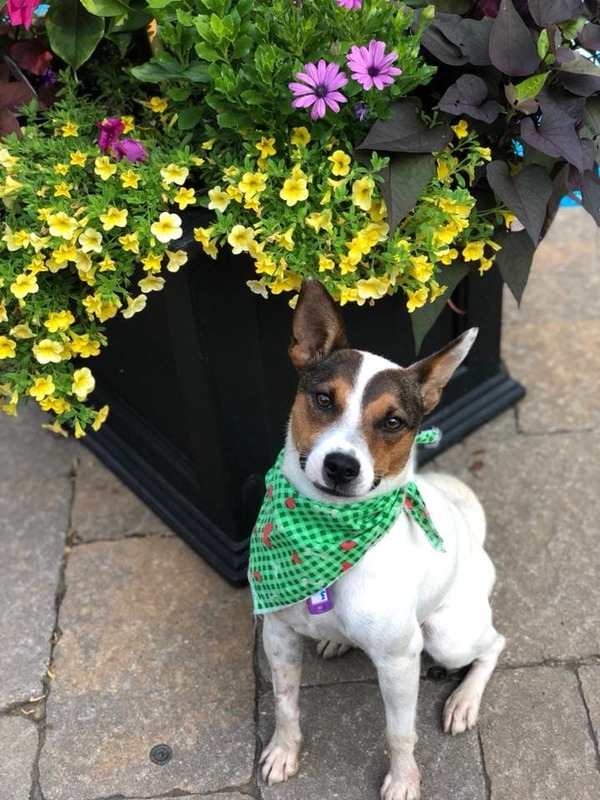 Rex is a fun-loving, fearless, and playful 3-year-old Jack Russell mix with puppy energy who would be a wonderful addition to any family. He really loves his toys as well as being outside. In particular he loves balls and fuzzy toys that squeak. Rex also loves to cuddle and is very affectionate- he greets everyone he meets with kisses and tail wags, including other dogs, men, and children! He has demonstrated no food or toy aggression towards dogs or people. Rex always wants to be around his people and would love a home that can give him this kind of attention. We are proud to say that Rex is totally potty trained and has yet to have any accidents in the house! Rex already knows “sit”, but can use help learning other basic commands. Rex walks well on a leash, although he is learning to not chase after birds and squirrels on walks and in the yard. While Rex sometimes barks when he sees squirrels and birds, he is beginning to take corrections well. Rex is also very good in the car, at the vet, and doesn’t mind being in his crate. Rex may prefer to be in a home without a cat.